The old saying abs are made in the kitchen — not in the gym — really is true! Not only does a tight midsection look great it’s also vital for your core strength, supporting your lower back and assisting in daily movements. If you’re like most people, you want to look great, but don’t have hours to spend in the gym. You want a workout routine that brings results, fast. Combine this simple and incredibly effective 3-move ab routine with a healthy diet for optimal results. Hint: you can do it at the gym or in the privacy of your own home — wherever you have time to fit it in! Be patient, stick with it, and you will be amazed at your tight midsection in no time. To begin, lie on your back with your legs straight up in the air. Now, raise your arms so that they are pointing straight out towards your sides. While keeping your stomach tight, take your left hand and touch it towards your right toe. Come back up and then switch: use your right hand to touch your left toe. This is considered one set. Do this move 10 reps each leg for 3 sets. 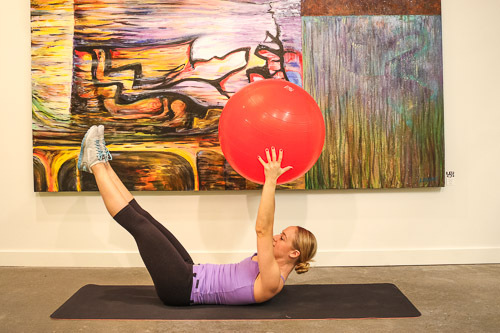 Now place your lower shins on top of an exercise ball. You should now be in a plank position with abs tight. Maintain this position and keep your upper body stationary, while pulling your knees in towards your chest. Exhale and squeeze your abs on the contraction. Now slowly straighten your legs, rolling the ball back to the starting position as you inhale. You can make this move even more challenging by keep your legs straight and lifting your glutes up towards the sky and coming into a V shape with your body. Start with 10 reps for 3 sets with perfect form. Begin by lying on your back with the legs straight up (bend them if needed). Put the ball between the feet, squeezing them to keep the ball in place, and lower both the arms and legs down towards the floor. Bring them back up and take the ball in your hands, lowering the arms and legs down towards the floor again. Continue, exchanging the ball between the hands and feet for 8-12 reps. Keep your back flat and your feet and arms off the floor throughout the movement to really challenge yourself. Jennifer Weintz’s mantra is EAT, TRAIN, and BE AWESOME. She’s an RHN (Registered Holistic Nutritionist), raw food chef, yoga teacher, brown belt in Brazilian jiu-jitsu, bikini fitness competitor, and BCRPA personal trainer.